About Bailey Cove Eye Care | Lens Options - Bailey Cove Eye Care P.C. In our dispensary we are proud to offer the very best in up-to-date lens technology, lens designs, and performance add-ons. Our staff is trained on new products and enhancements to keep you informed and seeing your best! An anti-glare coating will provide you with a wide range of excellent benefits! Combined with a scratch resistance, a partial UV ray block, and anti-smudge technology, the Crizal and Unity coatings are so helpful for day-to-day living. These coatings help allow light to come through the lens directly to the eye so that you can utilize it toward your best possible vision. Have trouble with driving at night? An anti-glare will help by reducing the halos around the various light sources you'll encounter on the road. A tale of caution: an anti-glare cannot be added on to an already-formed lens, so you must order it during your initial selection process in order to have this benefit added to your lenses. What is blue light? Blue light is a high-energy wavelength of light that can damage your eyes over time. It is emitted from fluorescent lights as well as the screens of computers, TVs, tablets and smartphones. With the rapid increase in technology use in our daily lives, blue light is becoming a growing concern. 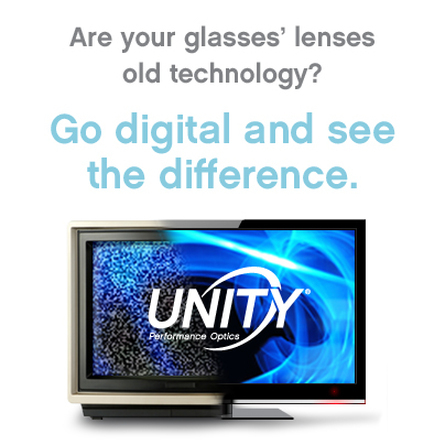 Both UNITY lenses with BluTech and lenses with Crizal Prevencia protect your eyes from the harmful blue light that can lead to age-related macular degeneration (AMD). Who should get Blue-Light protection? Technology users. Using computers and digital devices directly exposes your eyes to blue light, increasing your risk for AMD. Children under 18. Your kids don’t yet have the fully developed protective pigments adults have. Post cataract patients. Although some protection may be provided by the artificial lens placed during surgery, all natural protection is removed. Patients at risk for AMD. Genetics and other health risk factors make these people more likely to get AMD. What are computer vision lenses? 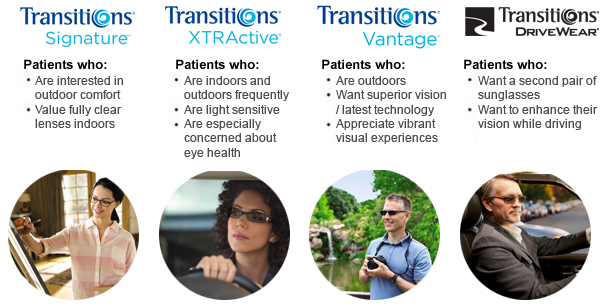 If you spend more than two hours a day in front of a computer, tablet, or smartphone, you’re a great candidate for computer vision lenses, which are available in both single vision and progressive lens styles. Nearly 70% of people experience some form of eyestrain while using digital devices.